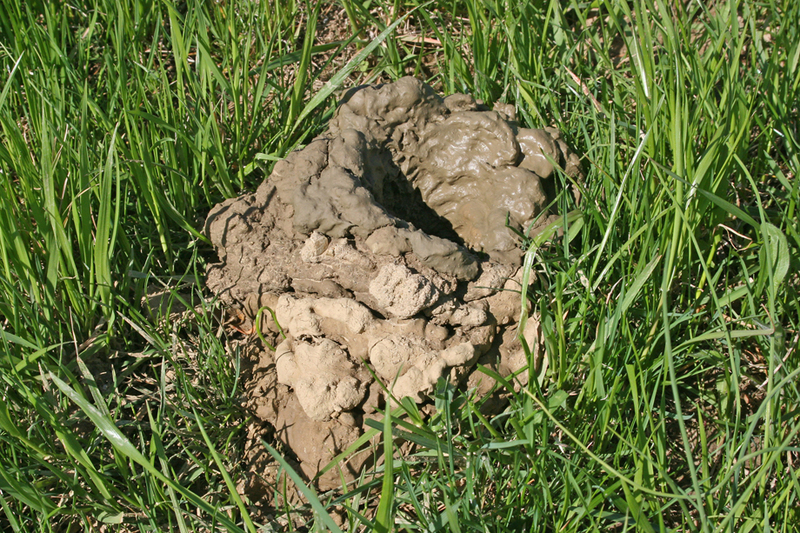 Mud "chimneys," the nuisance handiwork of Terrestrial or Burrowing Crayfish are rising above turfgrass in central and southwest Ohio. There are several species of burrowing crayfish, but most belong to two genera: Cambarus and Fallicambarus. Like their aquatic cousins, these crayfish use gills to extract oxygen from water. However, unlike their water-soaked cousins, burrowing crayfish spend most of their lives on land. They must dig their burrows down to ground water so they have a ready source of oxygen. This connection to a high water table explains why most burrowing activity occurs in poorly drained soils near streams or around shallow ditches. The crayfish throw soft mud up around their exit holes as they excavate the soil. These chimney-like structures may tower 3 - 8" above the soil surface and can present a real hazard to mowing. Indeed, hitting a sun dried brick-hard crayfish chimney with a mower dulls mower blades and sends up a huge cloud of dust … often accompanied by a stream of expletives. Unfortunately, there is little that can be done to directly control these terrestrial "mud bugs." DO NOT Pour toxic materials down the holes to kill the crayfish because the burrows extend down to ground water which could become contaminated. Management generally focuses on physically reducing the high profile of the chimneys, patience, and habitat modification. The chimneys can be stomped or raked smooth prior to mowing. Patience focuses on recognizing that most of the crayfish's excavation activity occurs early in the season, and will subside as the season progresses. Habitat modification focuses on improving water drainage to lower the water table. This may involve lowering nearby drainage ditches. A more direct approach to managing these annoying crustaceans is to apply a little stealth to hunt them down and kill them. The omnivorous crayfish may range several feet from their burrows at night in search of plant and animal food, living or dead. They are not fast as they crawl across the ground and are highly susceptible to a well-aimed foot.